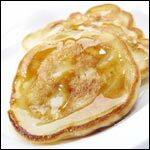 This recipe for Pancakes was submitted by Mr Breakfast on 6/9/2010. Click here to view the recipe. The best thing ever in the world! Try using maple flavored bacon. Yummy! Very good. I used medium thick bacon. Yum! Tip from my husband: Use a squeeze bottle to squeeze the batter over the bacon slices, then the batter doesn't spread out as much. The pancake tastes like bacon and it was good. I had like 6 of them and I'm fixing more tomorrow. Yummy in my tummy! Making pancakes, making bacon pancakes! Sounds great. Can't wait to go home and try it. Thanks! Brilliant! I will never make a pancake the same again. I tried this recipe last weekend! It was fun and delicious! Thank you for this post! 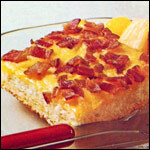 - Lou E.
Saw the picture shared elsewhere so I looked for the recipe and found your site. Brilliant idea, very easy to execute too. I use a homemade mix to start and it was fantastic. I'd make this again for sure. Thanks for sharing! Mmmmmmm! Me and my mom both loved it! Brilliant! Bacon stayed crispy for me. Great combination of flavors. I'll make it again... maybe even tomorrow! Bacon makes everything better! Can't wait to try this! It was alright I suppose. Tasted exactly like you would think it would. 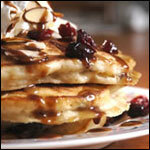 I use Fiber One Pancake Mix and always sift the mix first. It calls for adding water but I substitute with light coconut milk and it makes the batter taste better. I also use Turkey BACON which is healthier and holds its crispness. This is great for snacking also. Pancakes come out AWESOME without the syrup. Also... I make double the recipe and leftovers I can put in toaster for when I need a snack. I'm going to see what happens if I lay the nearly crisped bacon on top of the pancakes shortly before flipping them while the batter is still somewhat uncooked on the top but fully cooked on the bottom to see if this helps maintain the crispness of the bacon. I'm hoping that by finishing the cooking with the bacon exposed to the direct heat of the griddle it will come out just right. I'll message back if I'm successful. This is a dutch recipe! I have been eating this forever. I love it! It's okay. Good, but not really super good. Guess it depends on who makes it. Very cool recipe. Found it last night on StumbleUpon. Made it this morning. And now my life is forever changed. Loved it! Thank you! I used this for my blog, I hope you will not mind. Hooray! Pancakes! Plus bacon! Hooray! See Time Travel Kitchen. Great idea. Happy husband loved it. We'll make it again for sure. Great find. I love pancakes and I love bacon. I do agree with the comment about it being better if the bacon stayed crisper, but the flavor was amazing. Thanks for sharing this one. In the words of Epic Meal Time, "Add bacon strips, add bacon strips, add bacon strips, " etc. The world needs more bacon. The bacon doesn't stay crisp, but you can't argue with amazing flavor. Drooling. You're my new favorite website. Do you have a button? Finally tried it on Sunday. It was awesome. Just make sure to cook up your bacon really crispy and pat down with a paper towel to reduce grease. If you pour batter over limp bacon, it turns out chewy. BUT... if your bacon is crisp, it turns out amazing. I have done cooked bacon in waffles and they are good too! I am 100% going to make these this weekend!! Will do this tomorrow morning for my family. My family makes the waffle version of this. Love it!!! Shouldn't you be thanking Aunt Jemima for this recipe and not yourself??? You're absolutely right Baconator. 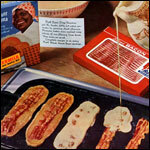 Huge thanks to Aunt Jemima for this recipe and many decades of excellent contributions to breakfast. That little space where I thank myself shows the person who submitted the recipe. Very valid comment Baconator.